Every year around Independence Day, sales of street-side Indian national flag replicas go up as a good number of people put up the flag on their vehicles to show their patriotism. However, most of these flags are made of plastic and after Independence Day, people throw away such flags creating a huge pile of garbage. 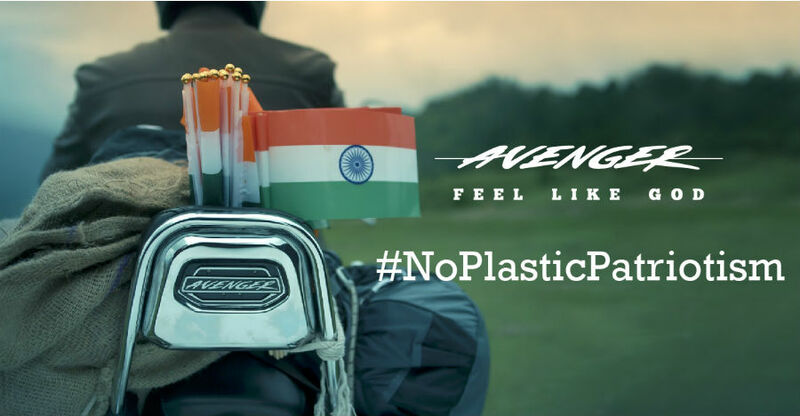 Bajaj has tried to raise the issue with a campaign with the Bajaj Avenger. The advertisement shows the rider, on the Bajaj Avenger, on a hilly road in India. When he stops at a traffic signal, a flag seller comes to put up a flag on his bike. The rider takes off the flag and gives it back to the seller. Later, the video shows a hawker selling flags to the school children travelling in a bus. Later, the rider can be seen cleaning an area that is filled with the plastic flags in the mountains. The whole video plays the soundtrack of the patriotic song “Saare Jahan se acha, Hindustan humara” in the background. It is a true incident that occurs every year in India. Tonnes of plastic waste is generated because of such plastic flags that can be seen on almost all traffic signals. Most car owners use the flag on their vehicles but then throw it away after Independence Day. Plastic can be extremely harmful to the environment if not properly disposed of. To overcome this problem, people can use cloth flags. Yes, they are expensive but they can be re-used for a few years. To stop the widespread popularity of such plastic flags, one should stop buying them completely. Once the demand stops, the supply will take a hit for sure. Also, the government should take steps to curb plastic flags in India to bring down the amount of waste. Bajaj Avenger has been using the tagline “Feel Like God” and the video comes to an end after showing the tagline. It sure feels good to do something good for the environment and protect it from such celebrations.